The training consisted of 3 days of giant slalom training followed by 3 days of slalom training. 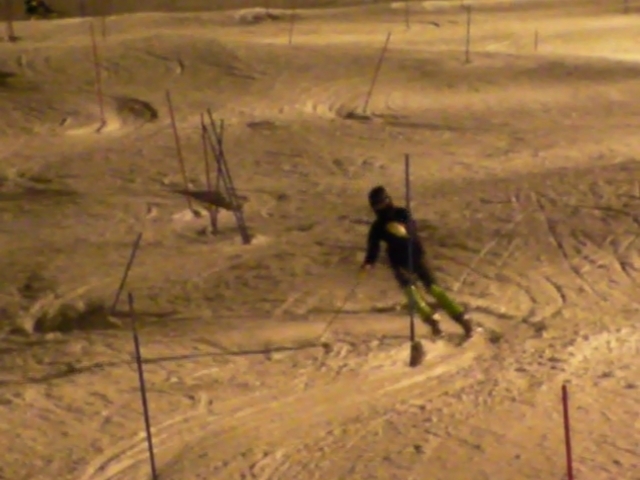 Thomas Larby (pic) shows how to carve a neat line through the giant slalom gates. The highlight of the week was to be invited to ski with the resident Voss Ski Racing Club during the Wednesday night club practice, the Club were very generous in allowing us to use their facility and we are delighted to have been able to train along side their budding "Svindals". Ellen Hirst (right) shows how to attack the course set up by the Club. All skiers improved their technical ability as a result of (in some cases) over 200km of course practice and intensive coaching from John, Craig and Lee. A computer in the restaurant allowed skiers to see how far and how high they had travelled on any given day - it didn't display the amount of time spent drinking coffee and hot chocolate thankfully! !